Since my herb garden produced so well this year, I wanted to come up with some other way of using them besides drying and/or freezing. So I had this grandiose idea of using them to make flavored oils and vinegars. The vinegar isn’t going to happen this year, but I did do a handful of oils – one with sage, one with tarragon, one with a mix of thyme, parsley, and oregano, and one with jalapeño peppers. I used what I still had available fresh (which is surprisingly still quite a bit, given how late in the season we are) – I’d have done a basil oil too, but basil is the first thing to bite it when frost hits. Maybe rosemary or mint, too? If this turns out halfway decent, I’ll get an earlier start next year. Anyway, I’d recommend starting with a lighter (taste) oil, like sunflower or safflower? I thought extra-virgin olive oil would probably have too much flavor of its own, and mask the herbs I added. Though it probably would have been good with the Italian mix. I didn’t measure anything, just added a few clumps of each herb to a clean bottle. Since I’ve never done this before, I have no idea how it’ll turn out, in terms of flavor strength. I could have added too much or not enough, but I won’t know until it’s done. I only added one pepper, again, because I’m not sure how strong it’ll be, and we’re not really fiery-hot kind of people here. 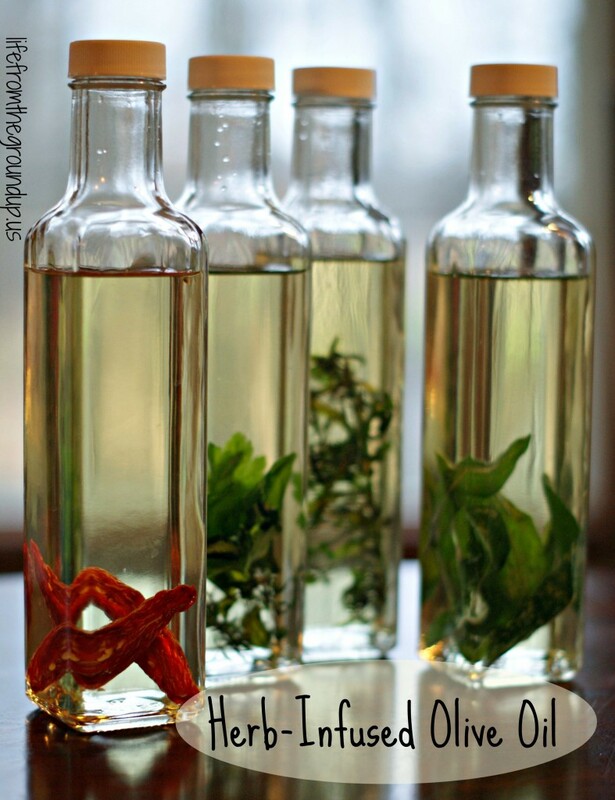 Once the herbs are added, fill the bottle with oil. Let it sit for a couple weeks to infuse. I’ve read that you can either leave the leaves in the bottle, or strain it after several weeks, but leaving them in may result in a slightly shorter shelf life (which should be several months). If it’s not strong enough, let it sit for a while longer. After the oil has reached a suitable flavor level, it’s ready to use. On what… well, I really didn’t think that far ahead, so I’m not sure. I just thought it would be fun to make, and I like bottles of oil with stuff floating in them. Weird. Maybe use as a base in salad dressings? Drizzle the sage oil over some homemade butternut squash risotto? Stir-fry some chicken and veggies in the hot pepper oil? Anyone ever done this before, or have any good suggestions for use? The Italiano one sounds great. WE make a fresh pizza with basil olive oil as a base with fresh veggies and a whole wheat home made crust.